The PAS-0.1-20 is a low-noise, broadband, high-impedance pre-amplifier designed to cover the frequency range of 0.1 to 20 MHz. The actual frequency range is significantly larger. The input impedance is 37.5 KW shunted by approximately 20 pF of capacitance. 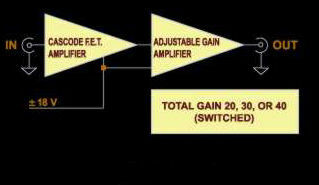 The total gain is switch selectable to 20, 30, or 40 dB. The output impedance is 50 W and will drive 1 V peak-to-peak (Vpp) into a matched load. ± 18 V power is normally supplied from a RAM system. However, the unit will work with ± 15 V supplies.